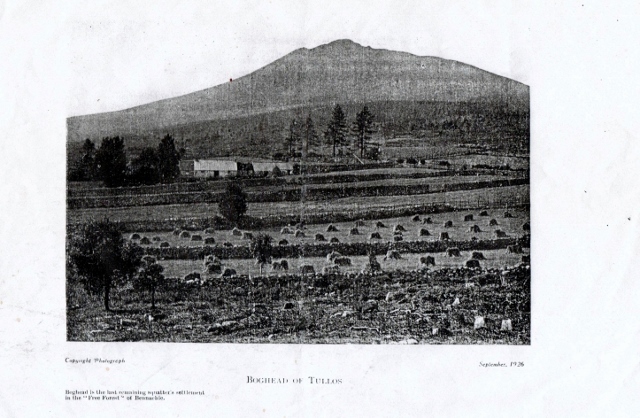 Essons were one of the small number of families known as Settlers or Colonists who settled on the Commonty of Bennachie in the early part of the 19th century. They were living around Bennachie well over a hundred years before the Colony was established, the roots of their name most likely farther West in Aberdeenshire, perhaps around Kildrummy. George Esson was said to the be the last of the Colonists, and descended from the first. Information on the Essons of Bennachie is below. The Bailies of Bennachie site is also very useful. Two people named Esson were recorded near Bennachie in the 1696 List of Pollable People in Aberdeenshire. William Esson was at a farm called Murriel, which is still there, about a mile from the western foot of Bennachie, while Elspet Essone, the wife of a wright called James Archibald was at Keig. Given other information we have, it seems likely these people were related to the Bennachie Essons. Census records of 1841 and 1851 for Chapel of Garioch show William Esson, George Esson’s grandfather, aged 80 and 94 respectively, born in Keig. Census dates are not all accurate but these suggest William was born about 1760. That does not tie in with any of the birth records we have, but it seems likely he was closely related to the other Essons at Keig. We have a number of records for them. Agnass Esson married James Shirraws on December 20th 1759. This was only the second marriage recorded in Keig, so no doubt there had been other Essons married before then. William Esson married Ann Simmers on 07/6/1766. Eight baptisms were recorded between 1763 and 1778. Of these James, William, John and Robert were children of William Esson and Mary Simmers. Joseph, the eldest of the eight was son to a William Esson, but he was born three years before William married Mary. He could well have been the son of another couple. William Esson and Mary Simmers’ first child was born at New Balygowan, and they lived afterwards at Wester Glenton, and then Easter Glenton. When Benjamin was born they were recorded at a place called “Quarry”, possibly the place Corrie today, or possibly even a Quarry close to the Don. (This is a point I imagine can be clarified). Benjamin, the son of William and Mary was born in 1777. His was a very unusual first name for an Esson (considering the whole of Aberdeenshire). The witness at his baptism was a Benjamin Forbes, and it seems possible this was where the name came from. Later we see no mention of a Benjamin Esson, but we see Forbes Esson mentioned often. Perhaps Benjamin chose to use that name, as there are no birth records for a Forbes Esson. 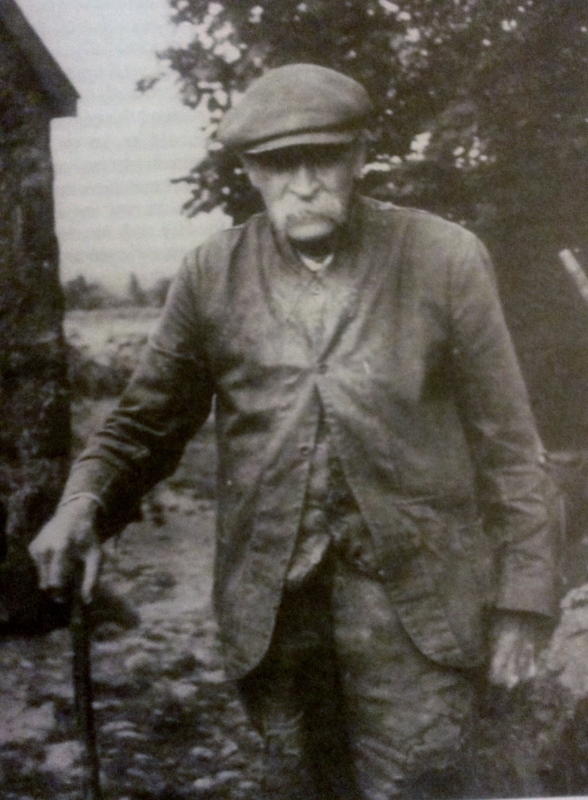 George Esson’s grandfather William, was recorded at a farm called Edderlick in Premnay, just North of Keig. It was very close to Murriel, despite being in a different parish. William married Jean Petrie in 1811 in Premnay. The question of Jean’s parents is significant because stories were common that “William’s father-in-law” was the first settler of 1801. This claim seems hard to confirm. From church records, it seems most likely that Jean Petrie’s parents were Alexander and Janet Pettrie (sic) of Premnay. (Janet had been born Janet Spence). Jean was also recorded as “Pettrie” in her baptism record, with an appropriate age, but the name was written as “Petrie” in later records. Alexander and Janet were married on 4th June 1765 and Jean was baptised on 19th March 1772. That again seems to match with information we have for William’s wife, Jean. Jean’s father, Alexander Petrie’s origins are less clear. The only Alexander Petrie recorded born in Premnay seems too young to have married in 1765 as a marriage record suggests, but records were “patchy” around 1750 and earlier and so little can be assumed. As well as William, a Forbes Esson (see note above for Benjamin), and a Joseph Esson lived at Edderlick. They were William’s contemporaries and, given all three seemed to attend baptisms for each other’s children, they may well have been brothers, or at least cousins. There are in fact four marriage records for a Forbes Esson in Premnay and Chapel of Garioch. It is just possible, though maybe a little implausible that this was one person. If written accounts by James Allan and the Reverend Campbell are believed William’s father-in-law was living on Colony land in the 1820’s when William, Jean and son John moved there to join him. At that time its suggested he built a house for the family, and while living there, also built James Allan’s father’s house at Blindburn for £20. Considering all of this carefully none of it is certain, but it is at least possible. The least likely aspect being William’s father in law. In contrast, it seems clear William’s children, William and Helen Esson, moved from Premnay to Hillhead of Fetternear after 1819 but before 1832. William junior had a son there called James with Elspeth Cruickshank at Fetternear in 1832. Perhaps William senior lived on Colony land when quarrying stone, but stayed with William and Helen at Hillhead of Fetternear, when he was working on the house at Blindburn for example, or more likely moved to live with his daughter Helen when he retired. William senior and Jean were recorded at Hillhead of Fetternear in 1841 with their adult children Helen and William. The family moved from Hillhead of Fetternear in 1841 it seems as William is recorded on the baptism record of Alexander Adam, one of Helen’s illegitimate children. All were then at “East End of Bennachie”. Meanwhile John Esson, George’s father might have been the 20 year old recorded working as a farm labourer in Insch in the 1841 census. He is not to be seen elsewhere. Whether that is so or not, John moved to the Colony, quite possibly with the rest of the family in 1841, but certainly before 1847. He married Sarah Findlater on December 4th 1847. Sarah was the daughter of James and Susan Findlater, and so John’s father in law was already on the Colony, living in Shepherd’s Lodge when John moved in. This sounds uncomfortably like the story of John’s father William’s move to the Colony, and given other confusion in the tales it casts some doubt on the earlier story. The whole family lived in Boghead of Tullos, or Esson’s Croft, the house they built. Depending on what is believed, either the house had been started in the 1820 by William and was now completed by John. Or it was now in the 1840’s it was built, mainly by John. From census records showing numbers of rooms, we can be sure it was developed over time from one room to three. George, or Geordie Esson, was born on 1st May 1864. He was John and Sarah’s last child. He lived for most of his life at Boghead of Tullos, or Essons Croft as it was known. The picture to the left was taken by Jeanie Cormack, the daughter of his friend Robert Cormack. His father and two brothers were stone dykers at the time of the 1871 census, when he was recorded as a 6 year old scholar. George attended Chapel of Garioch School from 1871 and seems to have left in 1880 at the age of 14. He reached standard 4 which was above the average attainment. In those days it was normal for children to attend school between the ages of 5 and 14, although they typically attended for only for 4 years, and often sporadically. George therefore seems to have been at school longer than many. As a youngest son of a large family, perhaps there was a little less pressure to work and neglect his schooling. A letter of George’s, dated January 21st 1838, is included in the book “Bennachie Again”. In it he mentions politics leading up to the Second World War, and that people were dreading the prospect. Like his father he had a keen interest in the area and he was a collector of items of historical interest he found on Bennachie and nearby. Unfortunately none of these items has survived that we know of. As mentioned, most of George’s male family were stone workers, and in 1870 James Esson, probably his cousin, had a lease from Balquhain Estate for the small quarry next to Shepherd’s Lodge at the cost of £2 a year. The 1871 census shows James employing two workers. George’s mother died in 1880. The 1881 census records him as a labourer, living with his father and Aunt Susan Findlater who was recorded as a servant. The rest of the family had moved out by then. In 1885 John was paying rent of £3 10s a year for the house and croft, and Susan also paid £1 for “a house and yard”, no doubt a part of Essons Croft. In 1886 Mary, George’s sister, had a child while at the house, and married the father, James Duncan a quarryman of Sunnyside Kemnay soon after. Mary sadly died on 18th September 1931 at Market Green Insch. Her son (Norman as his name appears to be on the baptism record) was witness. At some point, in the 1880’s probably, George went to America. He spoke highly of Cleveland Ohio where he visited in his letter to Robert Cormack in 1938. Unfortunately George had a back injury and sciatica which was bad enough to stop him working and he was forced to return to Scotland. Perhaps George sailed back to Glasgow when he returned, as he joined the Ayrshire police force for a time (Fagen 2011). George’s brother James was in the Police Force in Lairg. Their eldest brother John Packman Esson worked for some time as a farm worker and then game keeper, before he also joined the Police, stationed in Ballater. He was at Aboyne and finally Alford, where he sadly died, aged 58 on 12th February 1907. He had been a respected member of the police force and was of highly. John had married Catherine Diack Coutts and had at least one daughter Mary. Police work was no doubt rough work at times, with the need to deal with farm workers and itinerant labourers. Being stone workers and labourers themselves could have stood the three brothers in good stead. They were renowned for their strength. James Allan recounts the Essons had lifting stones at Boghead of Tullos of similar size to the Dinnie stones. George’s father John died in 1890, and it seems George returned to Bennachie then and was staying at Boghead of Tullos with his housekeeper Mary Murray from 1891 to until 1911 according to census records. On 12th September 1916 George married Mary Ann Mitchell (ne Knight) at Auchmill House Newhills. Mary Ann had been married before, but had lost her first husband. She had a daughter, Elizabeth Murray Mitchell (Lizzie) who lived with the couple until she, in turn, married John Tough, a farm servant of Threepleton of Pitcaple on 3rd November 1932. Mary Ann, George’s wife died on August 13th 1937 (aged 74). After his wife’s death, Lizzie and John seemed to maintain contact with George as John. John was the informant when George himself passed away on 29th May 1939 at Esson’s Croft, aged 75. By that time he was said to be frail, an active but hard life having taken its toll no doubt. The Reverend Alexander Campbell presided at George’s funeral at Chapel of Garioch. He had an epitaph added to George’s grave including the words “George Esson, descended from the first, and himself the last of the colonists of Bennachie”. A violent storm in 1891 finally ended quarrying at the Lintel Quarry at Oxencraig it seems, probably the last significant quarrying thereabouts. Kemnay in contrast had developed at a phenomenal rate and George described his disappointment that a railway line had not arrived and that quarrying had not prospered in a newspaper article of 1939. The photograph to the left accompanied the article. It is a shame to think the family’s hopes for quarrying were not met but at least the environment of Bennachie was not spoiled by large scale quarrying. There is little doubt that George would have been pleased with that. Writing about George in 1939 the Reverend Campbell said “No distance was too great for him to walk to work, and samples of his work, of which he was rightly proud are to be found on all the neighbouring estates. But he always returned to the croft, his eagle’s nest from which he watched the world of lesser men. The Hill was his true background; it would have been difficult to say whether the croft belonged to him or he to the croft; for he was a strange man with strange ideas, essentially a solitary and with independence almost a fetish – his avowed creed “I beg and bow to no man and no man begs and bows to me”. More and more he grew a part of the hill, every stone and tuft of which he knew, and more he became a survival from an age that was gone”. Campbell’s account is very evocative and no doubt an honest, kindly meant view. Having said that, perhaps we might have slightly more sympathy with George’s viewpoints today than Campbell had in in 1937. That’s a guess, but in light of George’s travels to America, alongside his connection with the Colony community, its history, and his recent experiences of what he perceived as “mean” treatment by the Leslie’s over buying the house, perhaps his views would be more understandable to us today. George’s Grandfather William Esson, is thought to have settled on Bennachie for a time in the 1920’s. He and/or George’s father John built Boghead of Tullos. In his letter to Robert Cormack in 1938 George mentions how the house, also known as Esson’s Croft was sold, along with other properties of Fetternear Estate at an auction at the Kintore Arms Inverurie in 1932. Canmore and RCAHMS ((JRS), 28 May 1998) mention a sales brochure of that year, which gave particulars, saying Boghead of Tullos Croft, contained three rooms and the steading which comprised two small byres, a barn and further ‘timber and felted’ outbuildings. The details also stated the croft was let to George Esson; at that time the size of the farm was about 7 acres and its rent was £3 10s per annum. Interesting to note the rent seems to be the same paid by John Esson in 1885. Slightly contradicting the dates potentially, Cumberbirch (2013) mentions Forestry Commission records which state that Alan Malcolm Charles Leslie sold 27 acres of land previously making up the North of the Colony, which included the 7 acre Boghead of Tullos on 28th February 1931. The buyers were Arthur Pye and Ernest Halford, who would have become George’s landlords. This date seems out of line with the Kintore Arms Auction, but there is no doubt a sensible reason for this. George had hoped to buy Boghead of Tullos, and he suggested in his letter t Robert Cormac that some agreement had been reached to that effect. However, in the end the house was sold to a person he described as the Farmer of West Fingask. This he thought was a mean thing to do, and given the history, and what his family had created from only rough ground, it is easy to see his point of view. 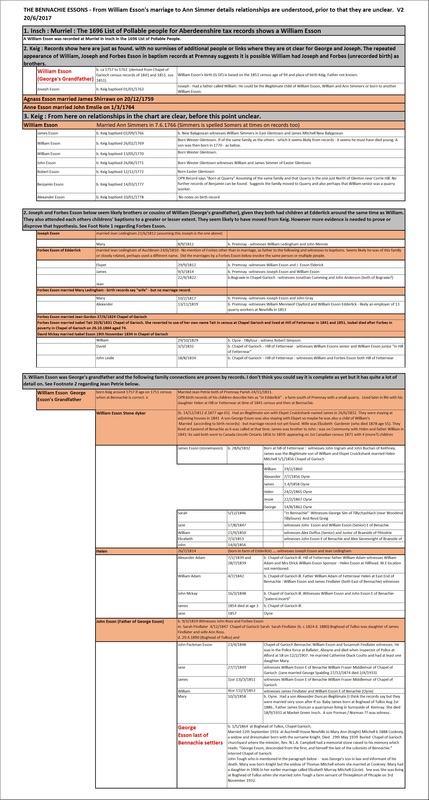 He stayed as tenant, but appealed the terms of the lease, and gained a rent reduction, security of tenure and the right to bequeath the tenancy on his death. Younger relatives, step children and so on were unable, or declined or to take on the lease of the house and croft after George’s death. The Forestry Commission no longer own Boghead of Tullos but they purchased the land in 1943 from Halford and Pye’s trustee, a Major Anderson. A report was produced at that time which noted that Boghead of Tullos was unfit for habitation and beyond repair. David Booth, a disabled ex-soldier had been living there rent free for 2 years, and it was said he moved to Chapel of Garioch after the sale. (Cumberbirch (2013). It seems poignant to think someone returned to living rent free on this land around 100 years after the first Settlers arrived, and eighty years after the first rents were charged. .
James Allan worked as a farm servant for eleven years from 1862, at eleven different farms around Bennachie. He came ultimately to lease Longfold Farm near the Colony and worked with and knew the Colonists well. In a Deeside Field article, also included in the book Bennachie Again, Allan also described in detail the extremely hard work by which they cultivated land on Balquhain and the Colony. There he helped the Settlers with their crofts . He talked about trenching, removing stones, turning the soil, fertilising it with guano shipped in by canal, burying the turf and later ploughing and arranging crude drains. “The squatters in my time were very respectable people with nothing of the tramp or gypsy about them. Each had built his own little homestead and reclaimed his garden and arable land. The largest holding or pendicle was of 12 acres. The houses were like my father’s, which I have described to you, walls of stone and clay, and divot roof thatched with broom or heather. There was no trouble about the title deeds. As famiies grew, extra rooms were added. One house had an excellent museum collection in my time, namely, ‘Esson’s collection’, now dispersed. That squatter’s son was a detective, and died as a Sergeant of Police at Alford. Let me think now. In the Sixties there were seven or eight families; George Esson, third of his line, is the only one left on the hillside today, still cultivating his croft. His grandfather settled in the Twenties, and married a daughter of the earliest Settler of 1801. The Esson were masons and champion dykers, and their works in the estates around, and on their own croft will long live after them”. The land at Boghead of Tullos still looks almost ready to farm today.